Metallofoldamers are oligomers that fold into three-dimensional structures in a controlled manner upon coordination with metal ions. Molecules in this class have shown an impressive ability to form single-handed helical structures and other three-dimensional architectures. Several metallofoldamers have been applied as sensors due to their selective folding when binding to a specific metal ion, while others show promise for applications as responsive materials on the basis of their ability to fold and unfold upon changes in the oxidation state of the coordinated metal ion, and as novel catalysts. 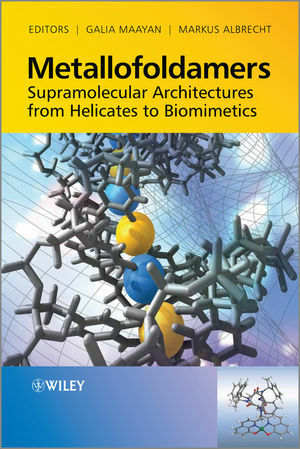 Metallofoldamers: From Helicates to Biomimetic Architectures describes the variety of interactions between oligomers and metal species, with a focus on non-natural synthetic molecules. Professor Albrecht was born in 1964 and studied Chemistry in Würzburg and Münster, spending time as a postdoctoral fellow in the laboratories of Professor Kenneth N. Raymond in Berkeley, and a habilitation at the Institute of Organic Chemistry of the University of Karlsruhe. Since 2002 he has been Professor of Organic Chemistry at the RWTH Aachen, where his main topics of investigation are the self-assembly, structure and property of helicates, and influencing peptide conformations by metal coordination. Dr Maayan was born in 1974 and studied Chemistry at Tel Aviv University and at The Weizmann Institute of Science, Israel. She is currently a postdoctoral research associate with Professor Michael D. Ward and Kent Kirshenbaum, in the Molecular Design Institute at New York University, investigating the interaction between biomimetic foldamers and metal ions.